1. Shut down your presario R3000. Disconnect all external devices connected to the notebook and the power cord. And remove the battery. 2. Turn the notebook upside down with the rear panel towardyou. 3. 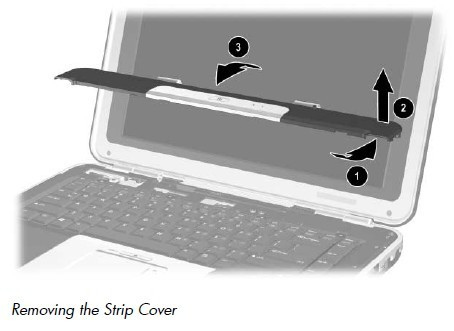 Remove the 3 PM2.5×13.0 screws that secure the strip cover to the notebook. 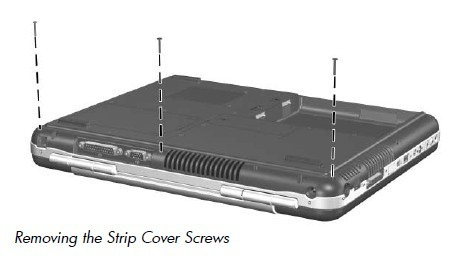 ✎2 of the screws that secure the strip cover to the notebook also secure the thermal cover. 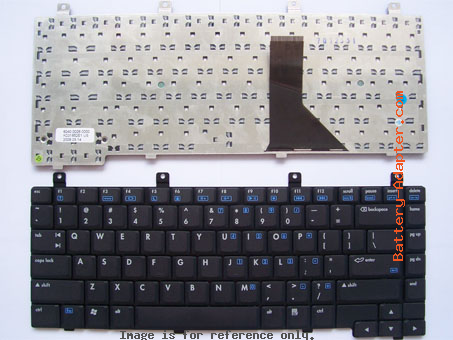 It is not necessary to remove the thermal cover to remove the strip cover. 4. Turn the presario R3000 right-side up with the front toward you. 5. Open the presario R3000 display as far as possible. 6. Using a flat-bladed screwdriver, lift the right side 1 of the strip cover to disengage the cover 2 from the notebook. 7. Lift the middle of the strip cover 3 and swing it toward you to remove it from the notebook. 8. Remove the 4 PM2.5×3.0 screws 1 that secure the keyboard to the notebook. 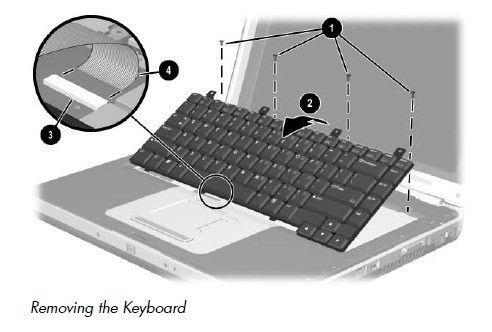 9 Lift the rear edge of the keyboard up 2 and swing it toward you until it rests on the palm rest. 10. Disconnect the ZIF connector 3 to which the keyboard cable is attached and disconnect the keyboard cable 4. 11. 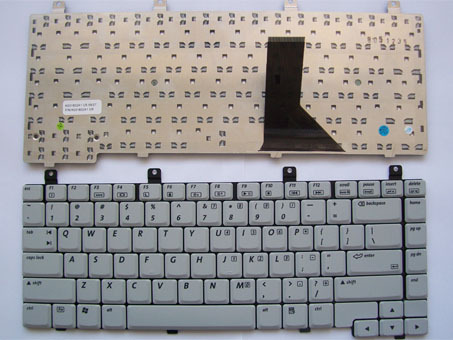 Reverse the above procedure to install the new presario R3000 keyboard.